First published inIEEE Transactions on Engineering Management.See citation. Complex time-critical projects require continuous monitoring by the project manager. For such projects, control chart tracking provides early warning of a likely late finish—in time for corrective action. The Project Management Control Chart (Schmidt Chart) is a tool for tracking, reporting, and controlling the progress of time-critical projects. This project management tool distinguishes between minor schedule slips and problems that call for serious management intervention to restore the likelihood of an on-time finish. Project progress plots as actual project time used against the completed critical path percentage. Control lines in the plotting space signal high or low probabilities of completing the project on schedule. When the Actual Progress line crosses a low probability control line, managers may decide to increase project effort and resources to bring it back on schedule. On the other hand, crossing a high probability control line means an early finish is very likely. The progress plot is similar to statistical process control charts common in manufacturing settings. The plot puts current performance into an historical context that everyone involved with the project understands. It serves to focus discussion and real time feedback to the project team, project manager, and other managers. 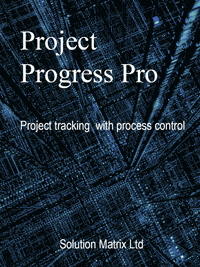 Executive Summary: Project Tracking With Statistical Process Control. Introduction: The project progress control chart. Example project progress control chart (Schmidt Chart). Monitoring project progress and project completion. Estimating project task time means and variances. First analysis: Are you winning or losing project schedule control? Statistical control lines for early warning of schedule changes. First control line method: Critical path variances proportional to task length. Second control line method : Individual critical path variances. Building and using the project progress schedule control chart. User input: Project task time estimates, expected values, and variances. Plotting data for project progress baseline and statistical control lines. For complete introduction to the business case for a proposed project, see the article Business Case. The Excel-based tool, Project Progress Pro, provides an easy way to implement the project control chart appearing in this article. Project Progress Pro does not require a statistical background. For more on the project business case, with calculated examples, see the PDF ebook Business Case Essentials. Business Case Templates and other case-building tools for Project Management are available in the Master Case Builder Shop. This article presents a tool for monitoring, reporting, and controlling the progress of time-critical projects. The "progress chart" uses standard PERT network data to give project managers the kind of control usually associated with process control charting in manufacturing. Simple visual tracking, comparing Actual Progress to the project plan. A clear distinction between minor deviations from plan and developments that call for intervention. An easy-to-interpret progress report for project team, project manager, and other managers. A simple way to compare different projects with respect to planning accuracy. During time-critical projects—developing new products for a competitive market, for instance—strong interest centers on the likelihood of finishing on schedule. Accurate information on progress relative to schedule may be crucial for scheduling IT resources, engineering work, manufacturing set up, product announcements, and customer shipments. In fact, the on-time finish is often a high priority in many kinds of engineering and product development projects. This is because a late finish in these cases typically has serious economic consequences, and may impact the firms ability to compete. Once a project is underway, however, it is not easy to read the probability of an on-time finish from PERT or GANNT charts. The progress chart, by contrast, shows these probabilities at a glance. Project managers, line managers, and high level managers all participate in goal setting and scheduling. Managers use both formal and informal tracking methods. Managers provide timely and well-targeted responses to project progress problems. Groups collaborating on projects maintain a high level of communication within and between groups. On projects where the most critical project goals are schedule goals, the progress chart serves effectively to focus these activities. The example below shows tracking of Actual Progress and Planned Progress for a completed project. The horizontal axis represents time since project start. Original project scheduling calls for a project start at t0 and a finish at time tPC. Time tPC is the total critical path (CP) time from a task/event network such as a PERT chart. The vertical axis represents project progress as a percentage of the CP (as explained below). Exhibit 1. An example project progress control chart. This example includes early warnings of the late finish. Had this project gone according to plan, the Actual Progress line would lie directly over the Original Plan baseline, reaching 100-percent completion at tPC, 32.5 weeks. Instead, actual finish time tAC was 39 weeks. Filled circles are critical path events in the plan, and open circles are actual event occurrences. Solid lines between circles show a continually increasing discrepancy between Actual Progress and and project plan. Control lines in Exhibit 1 warned of a likely late finish early in the project. The first warning came in week 8, when the Actual Progress line crossed the control line for probability p < 0.25. This was a signal that the project now had only a 0.25 chance of finishing at tPC of 32.5 weeks. The second warning came in week 18, when the Actual Progress line crossed the p < 0.01 control line. This was a clear alert, just over halfway through planned project time, that the on-time finish probability was now only 0.01 or less. As a result, managers now had a strong message that they must now choose between two options: Either (a) simply expect a late finish, or (b) apply more resources to raise the probability of an on time finish. What Can You See in the Actual Progress Line? Note that all segments of the Actual Progress line slope lessthan the baseline. This means, therefore, that that project planners underestimated task times consistently. However, because the Actual Progress line is smooth, everyone can see that progress was relatively continuous and that the expected critical path was in fact the actual critical path. This project very likely won approval and project funding with the support of a project business case analysis. Such a case weighs likely business costs and benefits from the project against likely results under other projects or under "business as usual" (not undertaking the project). And, an on-time finish was no doubt a key assumption in this case. Now, before committing more funds and resources to the project, management will probably ask for a new project business case, this time showing the consequences of a late finish. Design phases (or stages) completed. Percentage of total critical path time used. Exhibit 2 below is a top level PERT network for a product development project. Numbered circles are events and arrows are tasks leading from event to event. Starting event #1, for instance might be "Define Product Requirements." And, final event #15 might be "Begin Customer Shipment." Other top level CP events could be "Complete Logic Design Specs," "Verify Simulated Timing," "Assemble Prototype," and so on. For complex projects, managers will also use lower level plans of activities and events that make up each task on the top level plan. Exhibit 2. The PERT activity-event network for example calculations. Events are circles, tasks are arrows. Heavy arrows and blue circles represent the critical path for this project. Progress measures for this project will focus on the critical path through this network, the path through events 1- 4 - 7 - 11 - 14 - 15.
a = shortest possible task time. b = longest possible task time. m =most likely task time. These estimates (shortest, longest, and most likely task times) are the project manager's input data for the progress chart. They are the basis for measuring project progress and also for locating control lines, as in Exhibit 1. Conclusions about likely late or early finish depend on the validity of these three estimates. Notation note: In the following sections, the symbol t always refers to a time point on the horizontal axis. The symbol does not refer to the small sample statistic t.
See the section Building and Using the Project Progress Chart for more on these estimates as input data for the chart. Statistical note: E( ti,j ),the expected time for task i, j, can differ from themost likely task time assumption m in the equations above. Firstly, expected task time E( ti, j) is the mean (μ) of a task time probability distribution. Equation 1 shows how E( ti, j) derives from a, b,and m.Secondly, the estimated most likely task time (m) is the modal task time value in that distribution. In task 1,4 for instance, the product manager estimates a = 3.6, b = 7.5, and m = 5.6 weeks. As a result, the expected task time is 5.6 weeks and the variance is 0.422 weeks. Expected task times are the basis of the progress plot's Original Plan baseline. Task variances make possible control lines (following sections). Are You Winning or Losing Schedule Control? 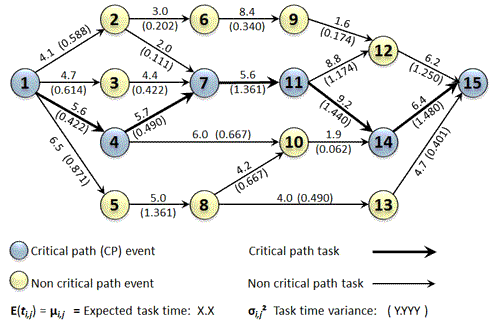 For Exhibit 2, analysis of the expected task times reveals a 32.5-week CP linking events 1, 4, 7, 11, 14, and 15. Exhibit 3, below, shows the CP by itself with an E(ti,j) for each CP task along with a percentage showing the task contribution to the total CP. The progress chart framework starts with these data. Exhibit 3. Project critical path events (blue circles) and tasks (arrows) for the progress chart. The project manager's estimated most likely task times add to make 100% of the expected project duration. In the progress plot, horizontal axis segment t0 – tPC spans the total planned CP length. Here, 32.5 weeks = 100%. And, knowing total project duration, essentially defines the plotting space. The horizontal (time) axis runs at least from planned project start to finish, t0 to tPC.However, the analyst should extend the horizontal axis beyond tPC, to allow for a late finish. The vertical axis (% of CP completed) always runs from 0 to 100 percent. The Original Plan baseline (Planned Progress line) runs diagonally from lower left to upper right, from point (t0, 0 %) to point (tPC, 100%). Critical path events appear on this line as filled circles in Exhibit 1. The actual completion times of CP events, as total time after t0 (horizontal axis). And, the original CP percentages for those events (vertical axis). Actual Progress event completion points are open circles in Exhibit 1. Exhibit 4 below shows the progress chart histories of four projects. The charts reveal discrepancies between plans and actual finish times. Exhibit 4. Progress chart histories of 4 projects. Each shows something different about ways that planned and actual task times differ. For Project A, all segments of the Actual Progress (blue) line slope more steeply than the Original Plan baseline (black) line. All tasks therefore finished under their planned times, and the project was "on track" for an early finish from the start. By contrast, the Actual Progress line for Project B shows consistently underestimated task times. Project B, like the Exhibit 1 project, gave indications of a late finish from the start. The Project C chart shows the effects of overestimating some task times and underestimating others. The extent to which the Actual Progress line deviates from or "hugs" the Original Plan line represents planning accuracy. 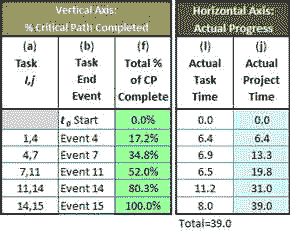 The Project D Actual Progress line shows what happens when tasks off the original critical path take longer than planned and therefore become CP tasks. This kind of planning problem results in horizontal line segments in the Actual Progress line. These are due to time gaps between the end of one original CP task and start of the next. Exhibit 4. Progress chart histories of four projects. Note especially that Actual Progress lines for several projects can appear together on the same chart. For comparing different projects this way, the analyst will probably wish to scale the horizontal axis as "Percentage of Original CP Time" instead of absolute time. The Original Plan and Actual Progress lines are descriptive statistics, easily calculated without reference to special statistical knowledge. And, for a given point on the CP, actual time used is simply compared to planned usage. Project managers can in fact plot and track these lines without a full PERT network. Project "phase transition points" or some other series of planned and actual event dates will suffice, as long as the sum of the segments equals planned project length. 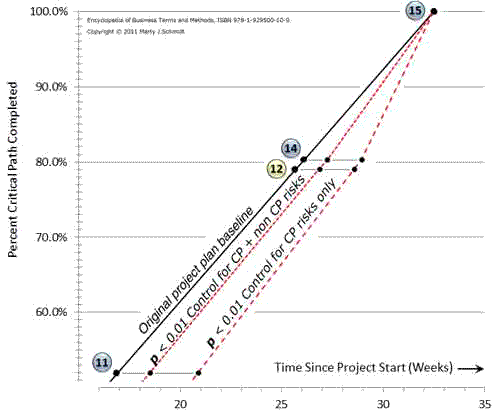 The control power of the progress chart increases, however, if the analyst uses task time variances to make probability inferences about actual project completion time. As Exhibit 1 shows, these follow when Actual Progress crosses a control line. Crossing a control line means simply that the probability of finishing on time is changing. Unfortunately, the explanation of statistical control lines is necessarily... statistical. The statistical theory is basic, but even that can deter those who are uncomfortable with the subject.At the same time, however, calculations for placing control lines on the progress chart are easy to apply by rote. This requires only a simple understanding of the three sentences in the previous paragraph. Statistical theory is here for the sake of completeness.Those interested only in building and using the chart may wish to go directly to the practical guidance under Building and Using the Project Progress Schedule Control Chart. 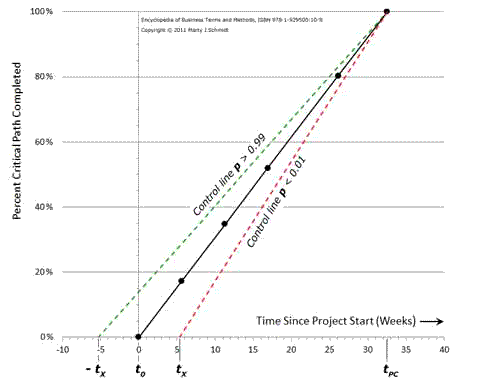 Each control line represents a probability p,the probability of project finish on or before tPC. The analyst may in fact show control lines for any number of pvalues between 0.0 and 1.0. The chart is clearer, however, if it shows only a few, e.g., for p = 0.01, p = 0.25, p = 0.75, and p = 0.99. Note that the Original Plan baseline is also the p = 0.50 control line. Actual Progress below baseline signals an on-time finish probability under 0.50. And, Actual Progress above baseline signals an on on-time finish probability over 0.50. Estimated Task times are independent. Actual time used for any task has no effect on estimated task time or variance of any other task. Task time probability distributions have means and variances given by Equations 1 and 2 above. Assumption 3 means that the Central Limit Theorem applies to sums of expected task times. And, this means the analyst needs no other assumptions about the shapes of individual task time probability distributions. Estimated finish time for the project is the sum of estimated critical path task times. This is because the Original Plan line shows each CP task ending where the next CP task starts. During the project, estimates for each task's a, b, and mdo not change (estimated least possible time, longest possible time, and most likely time). When the Actual Progress line crosses a control line, e.g., the p= 0.25 line, the probability of completing the project by tPC or sooner is 0.25. This probability holds as long as the original a, b, and m estimates apply. However, if the manager now deviates from the Original Plan—applying more resources than originally planned for a specific task, for instance—the original control line probabilities are not valid during that task. Should new control lines be drawn when resources are shifted, or when estimates a, b, and m otherwise changes? If the changes represent corrective actions for one CP task, to get the project "back on schedule," the original control lines should remain. They will apply again when the "unusual" task is completed. If instead, a, b, and m estimates change for several CP tasks, the manager should draw new control lines because the old ones will not be valid again. And, if changes in a, b, and mduring the project alter the CP itself, the Original Plan line may stay in place, as far as it represents finished tasks, but a revised baseline can be drawn for remaining tasks to the new point (tPC, 100 percent). Given Assumptions 1-5, we can choose one of several methods for plotting control lines. Consequently, to contrast methods 1, 2 and 3, each is illustrated with the data from the Exhibit 2 Project PERT chart . The simplest approach to control line placement is method 1, the Proportional CP Variances method. Most users will use this approach most of the time, not only because it is simple, but also because the additional assumptions it requires are usually quite reasonable. The likelihood of non CP tasks intruding on the CP is so small that we need consider only CP tasks when placing control lines. Variances of individual task time probability distributions are proportional to task length. 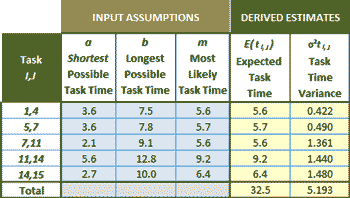 Individual task time variance estimates(which may or may not conform exactly to Assumption 7) are used only for estimating a variance for total project time. This variance is then "redistributed" among individual tasks as if Assumption 7 were true. If Assumptions 6 and 7 are not tenable, then Control line method 1 is not tenable. And, in that case, the analyst should use method 2 or method 3 instead. Exhibit 5 shows how to draw control lines under control line method 1, "Proportional CP Variances." Exhibit 5. Plotting points for placing control lines in the progress plot. Horizontal axis point tX where x refers to a probability value. Vertical axis point 0 percent. Horizontal axis point , tPC, where PC refers to project plan finish time. zX is the horizontal axis value under a unit-normal distribution, above which proportion X of the distribution lies. σ2T = Σ σ2i,,j for all tasks i,j on the critical path. Note that zX values appear in unit-normal tables. And, alternatively, they are produced with calculator or spreadsheet functions that deliver a unit-normal z value given a probability. Unit-normal z values, of course, depend only on the probability requested. For probability x = 0.01, for instance, zX= 2.326 and for x = 0.25, zX = 0.675. Control lines for probabilities over 0.50 always lie above the Original Plan baseline, while control lines for probabilities under 0.50 always lie below the baseline. The horizontal axis coordinate of these is found, as Figure 5 suggests, by extending the axis to left of t0, where negative values represent an actual start before planned start at t0. If task time variances are clearly not proportional to task lengths, Assumption 7 is not tenable. In this case, the analyst should therefore use control line method 2, instead, the method of "Individual critical path variances." However, the analyst should use control line method 3, instead, when both Assumption 7 and Assumption 6 are not tenable. Assumption 6 states that the likelihood of non CP tasks intruding on the CP is small. The project plan and critical path include some tasks that will certainly have very small variances (task length is known with high confidence), while other CP tasks have quite large variances, unrelated to overall task length. And, Assumption 6 is tenable. Probability distributions for individual tasks on the top-level PERT CP are approximately normal (Gaussian). Assumption 8 is reasonable if each task on the top-level PERT represents the sum of a series of tasks from a lower-level PERT. Method 2 is identical to Method 1, except that method 2 finds a newtX at each Original Plan CP event. The total variance at each CP event is then the sum of the remaining task variances. Equation 4 applies at each CP event, except that σ2T in the equation now represents all remainingCP tasks. Exhibit 6 shows the resulting progress chart with x = 0.01 and x = 0.99 control lines. Exhibit 6. Two control lines for the progress chart, constructed with the method of individual critical path variances. The horizontal locations of control line plotting points are calculated as offsets from the Original Plan baseline. The analyst finds tX in this way for each CP event through the next to the last (here, event 14); the control line is offset horizontally by this amount from each of these events. Engineering projects—especially those composed of several nearly independent sub-projects—are sometimes characterized by parallel and relatively independent activity paths which only meet at a few "nodal" events (such as "Prototype Assembled"). As long as Assumption 6 is tenable, however, critical path progress adequately represents progress for the whole project. However, when task time variances are large relative to expected task times, and when one or more non CP paths have a large variance, the manager may want to recognize non CP risks in the progress chart. The next section shows an approach that makes this possible. Unfortunately, calculating expected task lengths and risks so as to reflect the entire PERT network becomes a prohibitively complex and assumption-laden undertaking in networks with more than a few events. For progress plotting and control line purposes, however, it is usually satisfactory to apply basic probability rules so as to recognize just one or a very few especially risky non CP tasks. Exhibit 7 illustrates the approach. Exhibit 7. Including non critical path risks in control line calculations. (a) Two path segments considered in the example. (b) Time relationships in both segments. (c) Probability distributions assumed for path segments immediately after event 11. Example: Control Line Placement Method 3. Consider, for instance, the project plan portion in Exhibit 7(a), covering Exhibit 2 events 11, 12, 14, and 15. Here, the project CP links events 11, 14, and 15. The expected length of this CP segment is 9.2 + 6.4 = 15.6 weeks. Note that non CP path segment 11-12-15 is nearly as long: 8.8 + 6.2 = 15 weeks. 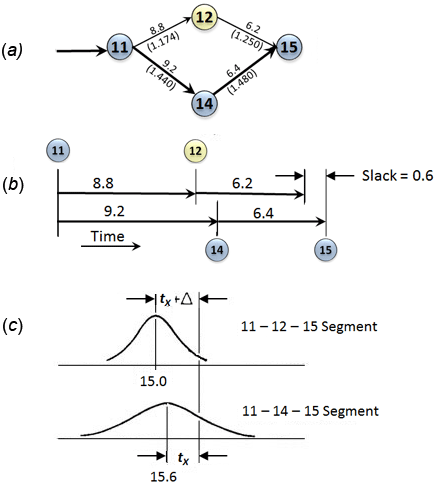 The 0.6 week difference between path segments is essentially "slack" time for the 11-12-15 segment. Firstly, the near critical nature of path 11-12-15. We may include the risk of path 11-12-15 entering the CP by invoking Assumptions 1-5, 8, and new assumption 9. Each non CP task that contributes to the progress chart will begin at the earliest possible time. As the time lines in Fig. 7(b) suggest, Assumption 9 puts all the slack in segment 11-12-15 at the end of task 12-15. For each control line probability x, the analyst now findstX horizontal axis "offsets" from the Original Plan line for each event, 11, 12, and 14.
p(A or B) = x, the control line probability. Given a control probability x, Equation 12 converts to a tX by Equation 10 or Equation 11. In practice, however, the fastest route to a solution may come from trial and error calculations, starting with proposed tX values and finding the associated Xs. Using the above method at event 11, tX for x = 0.01 is 1.75 weeks. This compares with a result of 3.97 weeks when path segment 11-12-15 is not considered. Exhibit 8, below, shows the p = 0.01 control line through a section of the progress chart plotting space, as method 3 prescribes. The same control line also appears as located by Method 2, in which the 0.01 control line ignores path 11-12-15. Exhibit 8. Comparison of p< 0.01 control lines, one representing only critical path risks and the other including risks for CP and non CP path segments located in the progress chart with Method 3. 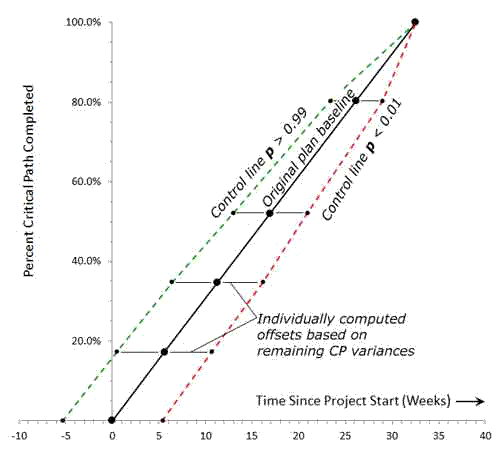 One conclusion from this demonstration of control line method 3 is that the presence of very risky non critical path tasks lowers the margin for error in project schedule planning, that is, the project manager is allowed less schedule "slippage" before the probability of an on-time finish drops substantially. Progress charts are typically built for project control and reporting by those who create the original project plan. And, this is usually a project manager responsible for project planning, projectexecution, project outcomes, and securing project funding. This individual is usually the best prepared person to supply progress chart input data—task time estimates. Schmidt charts are also built and used, however, by those in Project Management Offices (PMOs) responsible for project portfolio management, business analysts in budget offices, Line Managers who supervise project managers, and others who have a stake in on-time project completion. The project, described as path, a sequence of non overlapping tasks and task-end events. Examples above use CP tasks from a PERT network, but PERT analysis is not necessary for creating and using the progress chart. Estimates of task times for each path task. These include: The longest possible time (b), shortest possible time (a), and most likely time (m). Exhibit 9, below shows the project manager's original estimates for a, b, and m, for each CP task. These are the progress chart's user input. These input data appear in blue cells. a: Shortest possible task time. m: Most likely task time. From these values, the analyst derive an expected task time E( ti , j) and a task time variance (σ²i , j) for each task. These values appear in yellow cells above. Equation 1 produces an expected time E( ti , j) in each row from a, b, and m in that row. Equation 2 produces a variance σ²i , j in each row from a and b in that row. With expected times and variances in place, the rest of project progress chart plotting data derives as Exhibits 10A and 10B show. Note especially that Microsoft Excel plots the graphs in Exhibits 1 and 5 directly from data in Exhibits 10A and 10B, using Excel's scatter chart with straight-lines. Exhibit 10A. Plotting data for example progress charts in Exhibits 1 and 5. Data for control lines and baseline derive from Exhibit 10 A expected task times and task time variances. (rightmost two columns), using Equations 4, 5, and 6, along with standard source unit normal z values for the Gaussian distribution. The events and tasks in Columns a and b are simply names for horizontal axis plotting points. Columns c and d hold the expected task times and task time variances for each critical path task. Column e values are estimated task times from Column c. These are percentages of total critical path length. Column f (green cells) holds vertical axis coordinates for all lines in the chart. These are cumulative totals of task time percentages in column e.
The Original Plan baseline plots from vertical axis coordinates in Column f and horizontal axis coordinates in Column i. The baseline Column i coordinates are the cumulative task times at each event, added from expected task times in Column c.
% CP Completed = Percentage of CP completed at end of task i, j from Column f.
Total CP Length = The sum of individual expected task times from Column c.
Examples in Exhibit 1 and Exhibits 10A and 10B represent control line charting under Control Line Method 1. When assumptions about task time variances and non critical path tasks warrant the use of Control Line Methods 2 or 3, however, horizontal placements of some control line points may differ from those under Method 1. In these cases, the analyst finds control line horizontal placement at each task end as a horizontal offset from the Original Plan baseline, as Exhibits 6, 7 and 8 show. Actual project progress can be plotted, of course, only after project execution begins. For the Actual Progress line (as in Exhibit 1), vertical axis coordinates are the same as the corresponding vertical axis coordinates on the Original Plan baseline(from Column f of Exhibit 10 A above). These coordinates appear again in Exhibit 10B, below. Horizontal coordinates of the Actual Progress line are in blue cells of Column j in Exhibit 10B. Each is the total time since project start at t0 up to the task-ending event. Column i holds the actual time for each task. Total times in column j derive from the column i data. Exhibit 10B. Plotting points for the project's Actual Progress line. These points are added as soon as each actual task time is known. Subjects:Project tracking, project progress, project management. Description: "Progress plotting" is a tool for monitoring, reporting, and controlling the progress of time-critical projects. It helps distinguish between minor schedule slips and problems that need serious management intervention. it also serves to evaluate planning accuracy on previous projects. 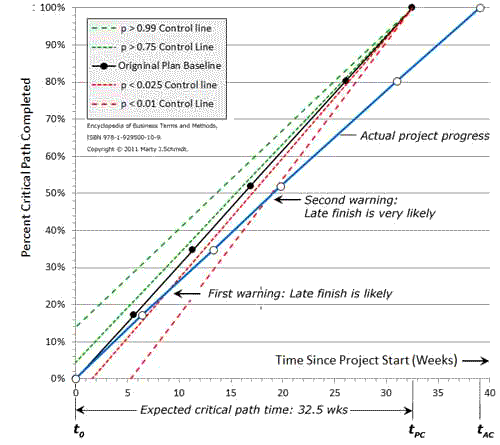 "Progress" is shown by plotting the actual project time used against the percentage of the critical path completed. "Control lines" in the plotting space indicate probabilities of completing the project on schedule. If the progress line crosses a low probability control line, managers may want to intervene and bring the project back on schedule. Crossing a high probability control line means an early finish may be anticipated with confidence. The progress plot compares to the process-control chart familiar in manufacturing. Like the control chart, it uses simple, familiar measures to put current performance into historical (statistical) context that everyone on the project can understand. It therefore serves as a focus for discussion and a source of continuous feedback to the project team, project manager, and other managers. Progress Pro—When projects simply have to finish on time.